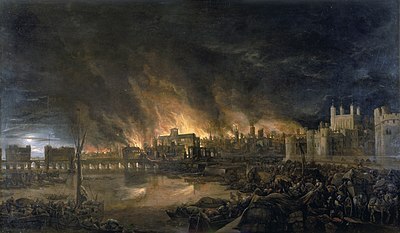 Hanson Neil (2002)։ The Great Fire of London: In That Apocalyptic Year, 1666։ Hoboken, New Jersey: John Wiley and Sons A "substantially different" version of Hanson's The Dreadful Judgement (front matter). Pepys Samuel (1995)։ Robert Latham and William Matthews (eds. ), ed.։ The Diary of Samuel Pepys, Vol. 7։ London: Harper Collins։ ISBN 0-00-499027-7 First published between 1970 and 1983, by Bell & Hyman, London. Quotations from and details involving Pepys are taken from this standard, and copyright, edition. All web versions of the diaries are based on public domain 19th century editions and unfortunately contain many errors, as the shorthand in which Pepys' diaries were originally written was not accurately transcribed until the pioneering work of Latham and Matthews. ↑ dates are given according to the Julian calendar. Note that, when recording British history, it is usual to use the dates recorded at the time of the event. Any dates between 1 January and 25 March have their year adjusted to start on 1 January according to the New Style. ↑ "Pottery". Museum of London. Retrieved 14 November 2014. ↑ Evelyn in 1659, quoted in Tinniswood, 3. The section "London in the 1660s" is based on Tinniswood, 1–11, unless otherwise indicated. ↑ 330 acres is the size of the area within the Roman wall, according to standard reference works (see, for instance, Sheppard, 37), although Tinniswood gives that area as a square mile (667 acres). ↑ Neil Wallington (2005). Case of Fire. Jeremy Mills Publishing. p. 18. 978-0-9546484-6-6. ↑ Neil Hanson (2011).The Dreadful Judgement. Transworld. p. 111.ISBN. ↑ Margaret Read MacDonald & Winifred Jaeger (2006). The Round Book: Rounds Kids Love to Sing, p.73. August House. 978-0-87483-786-5.